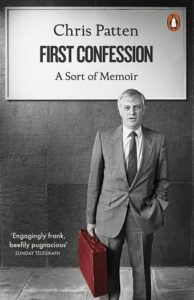 First Confession: A sort of memoir by Chris Patten. Chris Patten has written a very interesting memoir on his multi-faceted life in politics, coupled with observations on his contemporaries and the issues of the day. Indeed, a full life. Brought up Catholic (of Irish descent on his father’s side) middle class in West London and educated in the Catholic school system, he went on to Oxford via a scholarship. He then intended to join the BBC, but received a fellowship to study and travel in the US. This was an eye-opening experience in the early 1960s with the US at its post-war power and economic peak, but he also observed hard racism in Jim Crow Alabama. By chance he spent time assisting in a small way John Lindsay’s mayoral election campaign in New York. This whetted his appetite for politics and on return to the UK he got a job with the Conservative Research Department (he devotes a chapter on why he chose the Tories, but describes himself as a firm “wet”). This led, after various political/policy advisory roles, perhaps inevitably to his election in the late 1970s to the marginal seat of Bath and, in the 1980s and early 1990s, to several junior ministries – Overseas Development, Education and Science, Northern Ireland, and Environment. He comments on leaders – favouring Major over Thatcher and Heath, but also in praise of Kohl. In the lead-up to the ’92 election, he was appointed chair of the Party’s election campaign. They won, but ironically he lost his seat (am tempted to say he took a bath). Shortly after, Major offered him the last Governorship of Hong Kong, from 1992 to 1997, at obviously a very challenging time. Inter alia he did his best to encourage democracy there (not without opposition), which is ironic given that in its long colonial government, Britain had not encouraged this (he blames this at least latterly on British commercial interests). There is much discussion here on the politics and culture of Asia. When he returned to the UK, he had another role in Northern Ireland post the Good Friday Agreement. The Northern Ireland he worked in during the 1980s was a tragic country. But it was much different when he returned and he gives credit inter alia to Blair and Bertie Ahern – and he noted with pleasure the great changes they and others had wrought. Then followed five years as a European Commissioner with the EU. He considers Brexit a disaster, blaming the “blazers” (Tories) in rural England as playing a crucial role in this close decision. He writes with some regret on this, and similarly but separately with some concerns on Trump’s USA, but with ultimate hope subsequently. He also advised the Government on the visit to the UK of Pope Benedict, and has been an adviser to the Vatican, as well as Chairman of the BBC Trust. As if that were not enough he is now Chancellor of Oxford University. He finishes with a chapter on faith, and his faith and that of his wife (a practising Anglican), noting how many in politics seem surprised at his firm commitment to it. Obviously a very full life. He visited Australia some months ago. Geraldine Doogue interviewed him. It was just after Trump had announce the plan to move the US Embassy to Jerusalem. Patten described this as “diplomatic vandalism”. I suspect he must be wincing at what is happening in the US today! I found this a good read, even a ripping yarn! It is so much more than a chronicle of his appointments – it delves into the issues of history and of the time. Buy it or, like me, borrow it from your library.